Knucklebones is played by children the world over. 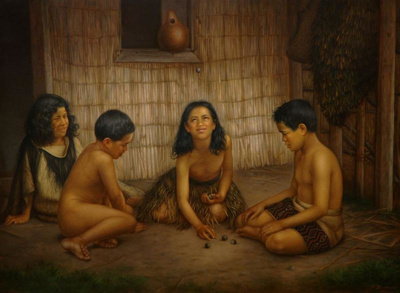 The game is known to Maori as koruru or ruru and is usually played with five stones, but more can be used depending on the ability of the player. This painting is one of a series of genre scenes that Gottfried Lindauer painted to record Maori customs which were made to show alongside the portraits of Maori in the Partridge collection.